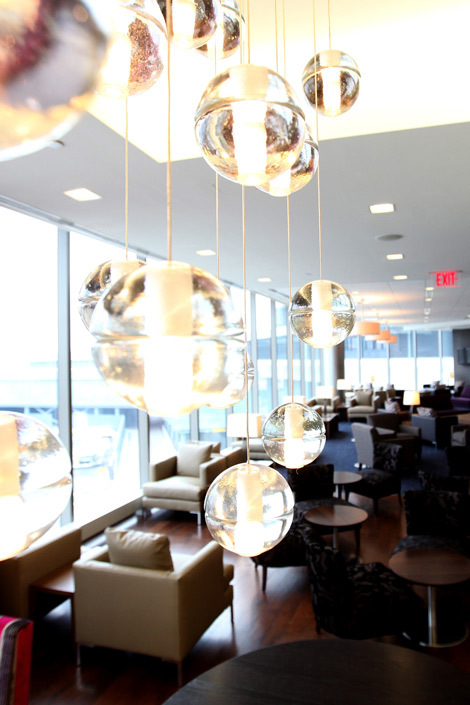 BACKGROUND British Airways opened its new Galleries-style lounge facility at Newark Liberty airport earlier this month (see online news April 4), following the relocation of all BA flights to operate from gates B50–B58. This means there is a shorter walking distance from check-in to security and through to the new lounge and departure gates. The lounge is 760 sqm, twice the size of the previous facility, with views over the airfield, and I am told even as far as the Manhattan skyline on a clear day. WHERE IS IT? 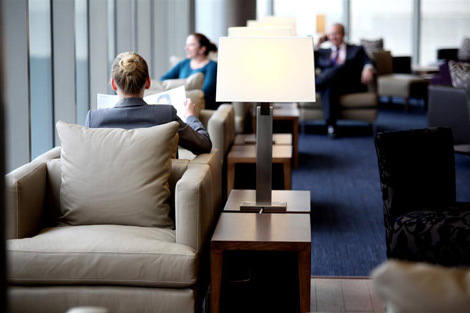 After passing through security for gates B50-58 the lounge is located on the right hand side, up one floor, from where BA now operates its flights at Newark Liberty. FACILITIES There are two dining areas: booth-style table service for First guests (to see the dinner menu during my visit, click here) and a hot and cold buffet with cafeteria-style seating for Club World customers, with staff on hand to clear plates and bring over drinks. There is a full bar and deli counter located in the middle of the lounge with various fruit, savoury snacks and packets of crisps. The bar has fridges at foot level stocked with beers, wine and soft drinks. On the counter there is a well-stocked selection of spirits with all the ingredients to make yourself a drink, including lemon and lime slices, olives, tabasco and various fruit juices. There were no draft beers or champagne on offer when I visited. There is also a cafe bar with tea and coffee machines and a selection of biscuits and pastries. The lounge offers 166 seats in both dining and lounge style arrangements. The dining areas are separated from the more comfortable seating towards the back of the lounge by the bar and deli counters. Also towards the back there are long comfortable sofas and deep leather armchairs, located around large wooden coffee tables and smaller tables with built in power points with US, UK and European sockets. There are also four PCs with one shared printer available for use. There is another smaller seating area located at the front of the lounge, near to the cafe counter. Here you will find a counter to the right housing a selection of US and international newspapers (The Daily Mail and The Times being the UK papers on this occasion) and a sparse selection of magazines. The lounge is decorated with elegant furnishing in a purple, black and beige colour scheme with both hardwood and carpeted flooring throughout. There are also plenty of fresh flowers, on this occasion large white orchids, and dozens of vintage prints of BOAC adverts (to see some of the posters from the lounge as well as other vintage prints and photos visit the Seatplans.com Pinterest page here). There is free wifi (password: America on this occasion) and a few flatscreen televisions with the volume down low and showing rolling news during my visit. The toilets are located on the right hand side as you enter the lounge and there is one shower – ask at the front desk for the key. There are departure boards as well as in-lounge announcements. FOOD AND DRINK The Club World buffet has a cooked-to-order station, preparing oriental chicken and vegetarian gyozas in a garlic ginger sauce on this occasion. Other options included chicken curry and rice, vegetarian lasagne, salads, a selection of cheese, cookies and brownies. In First dining the wine list is provided on an iPad. This can be handed round the table for customers to peruse, with the list on the screen grouped according to colour and region. The wine labels can be touched for a description and saved to a recommendation list which can then be handed back for the wine to be served. WHO CAN USE IT? 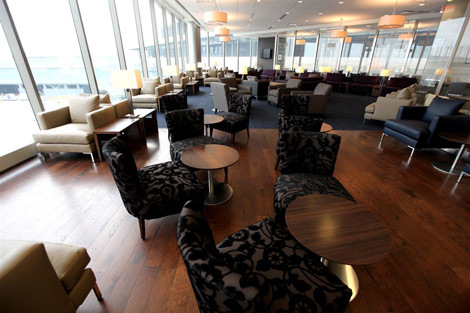 British Airways Club World and First passengers can access the lounge as part of their fare. Oneworld Emerald and Sapphire card holders are permitted access with one guest (excluding American Airlines Emerald and Sapphire on AA domestic flights). BA Gold guest list customers are allowed access with two guests and Gold and Silver members are allowed access with one guest. VERDICT A large and smart looking lounge with a good selection of seating and food and drink, as well as nice touches with the flowers and vintage posters. Cheerful staff were often on hand to check if I wanted anything, making for a relaxing wait.